Is Marketing the Weak Link in your Business Plan? – How would you rate the performance of your practice? – Do you have all the clients you want? – Are they all profitable for you? If you answered all Yesses, congratulations. You have an ideal practice. However, if you hesitated, or answered “No,” let’s talk about marketing. Or rather, . 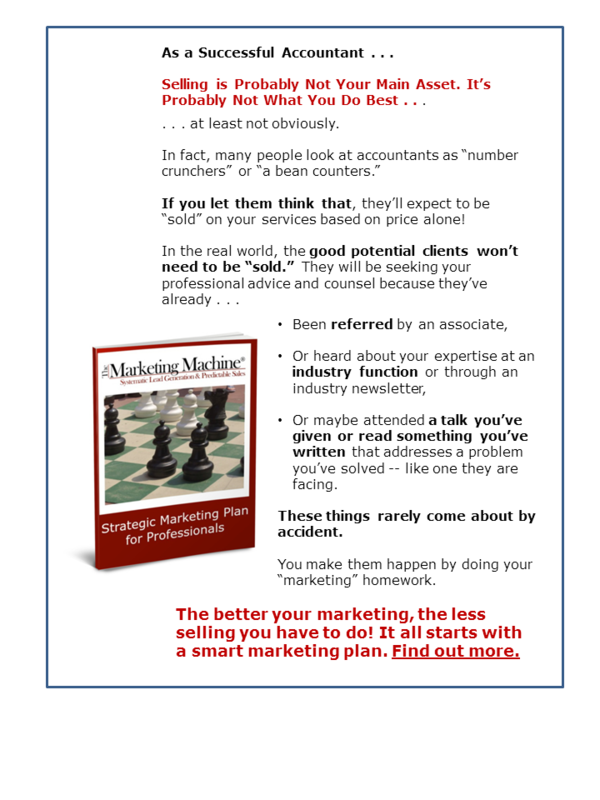 . .
Let’s look at how you feel about sales and marketing. If you’re like many professionals, there is likely to be some truth for you in these negative statements! The good news — all these negatives can be turned into positives! Now ask yourself . . .
How complete is your Marketing Plan? If it’s little more than a footnote to your Business Plan, it’s time to start over. Do you need a new start? Marketing starts with stepping back and getting a clear picture of you as business owner — your strengths, your habits, your experiences. A good marketing plan takes an equally close look at your practice — what it’s like now, and what you want it to be in the future. Our goal is to help you craft a customized plan that fits your practice and your goals — and that puts you back in charge. If this sounds like it could be the right thing at the right time for your practice, click below to get more details. The One Main Thing for Accountants. 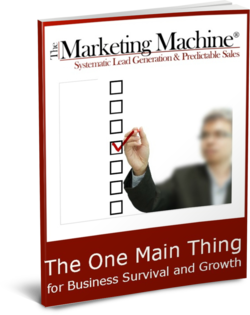 If you don't know what it is, grab this FREE report now.